As Head Chef at our luxury Cotswold Hotel, Richard Picard-Edwards shares his expert recipe on creating delicious Bergamot Truffles. Citrus Bergamia is a fragrant fruit the size of an orange with a colour similar to a lemon – the French call them citrons doux (sweet lemons), the Italians consider them bitter oranges. Take your pick, but in Britain the fruit is mainly valued because of the intense, fragrant oils in the rind. Bergamot flavour, famously, lifts tea (Earl Grey) and has a wonderful interaction with chocolate. Here at Lords of the Manor, bergamot truffles are a popular feature post dinner. A bain-marie also known as a water bath or double boiler is the best way to melt chocolate. When you place your bowl of chocolate over simmering water make sure the water doesn’t contact the bottom of the bowl. If there is direct contact between the hot water and the bowl this starts to burn the chocolate. 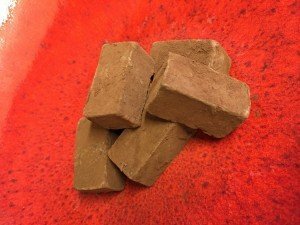 Picking the best quality of chocolate will help towards getting the best result in flavour. It’s important to emulsify the chocolates with the cream. If you don’t emulsify the fats together you will end up with a grainy texture, a very different product. Whisking together all of the ingredients gives the best results – adding a little cold cream at the end also helps to bring the mixture together. When you have your chosen shapes roll them in cocoa powder.